Chinese scientists say they have invented bendable lithium sulfur batteries, paving the way for producing a generation of flexible smart devices. Traditional batteries are made by pouring liquid electrolytes into solid electrodes, yet the new approach puts electrolytes into ultrathin metal layers to form 3D networks in dishcloth-like materials. "By doing this, electrolytes won't fall off the networks no matter how you flex or twist the flexible materials," said Zhang Hongzhang, a researcher at Dalian Institute of Chemical Physics (DICP) under the Chinese Academy of Sciences. Zhang and other six researchers from DICP published their findings in the journal Advanced Functional Materials in May. 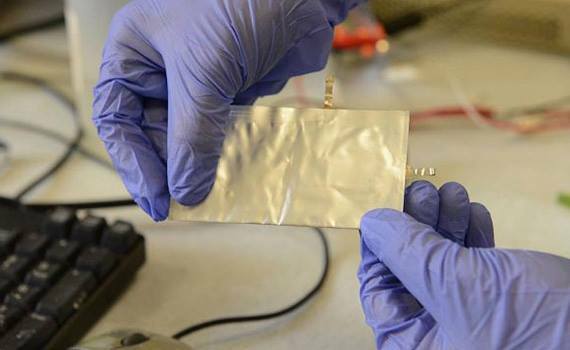 According to Zhang, flexible batteries based on this new approach can raise initial specific discharge capacity up to 1600 mAh, five times more than most commercial lithium batteries on the market. Zhang said, these batteries should be more stable and resilient, and when used in smart devices such as mobile phones, they could be twisted and bent while still storing large amounts of charge. "These batteries are light and have high energy density. The means of making them is cost effective and can be applied for mass production in the future," Zhang said.